Belleek ornament features an Irish Teddy bear wearing an Aran sweater. 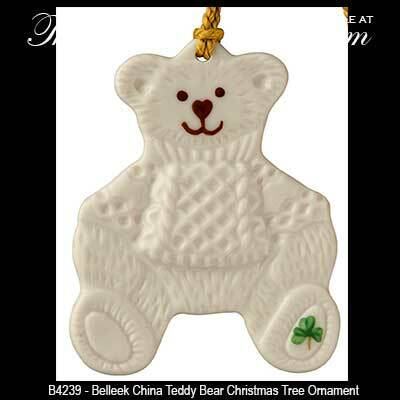 The Belleek Teddy Bear ornament was introduced in 2015. 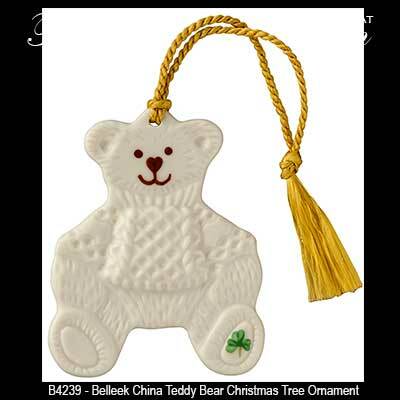 Belleek Teddy Bear Christmas Tree Ornament. Features Belleek's Hand Painted Green Shamrocks. Dimensional Design, 2 1/2" Wide x 3" Tall. Ready to Hang with the Included Gold Tassel. Gift Boxed, Hand Crafted and Hand Painted in Belleek, Ireland. Belleek snowman ornament is named The Night Before Christmas, and he features a Teddy Bear along with a hand-painted shamrock.